Defensive denial drills for disrupting ball movement and prohibiting easy offensive catches. Denial is the disruptive force in pressure man-to-man defense. The purpose of denial is to disrupt the ball movement, timing and sequencing of the offense. 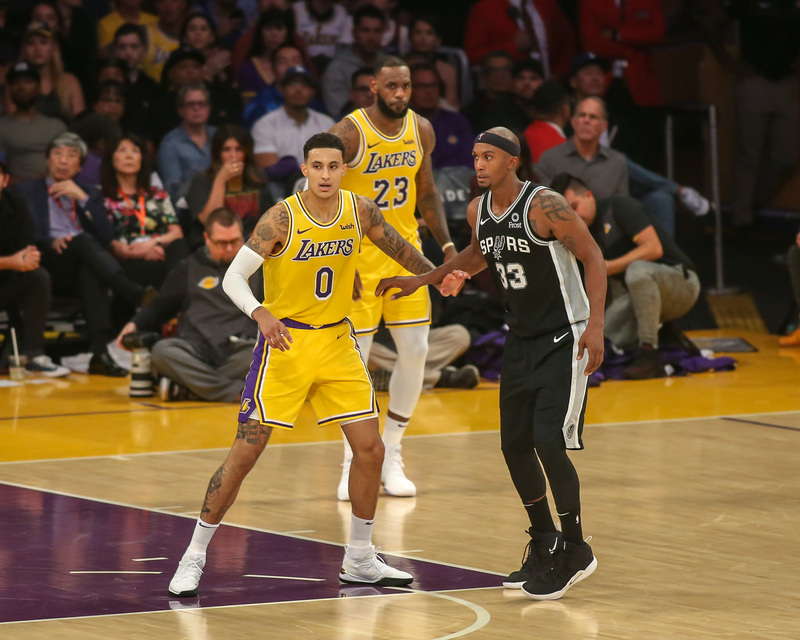 The aim is for the ball to become isolated forcing the ball-handler to abandon the tactics and strategies of the rehearsed offense and into playing one-on-one basketball. The drills below are to help defenders with point number two above – preventing catches. Competing in the passing lane while one pass away takes a combination of effort and technique which can be introduced and practiced in the following drills. Before we look at Three-Second Deny Drill, here are some pointers for the proper stance when denying the pass. Many offenses begin with a top-to-wing or point-to-wing pass. Perhaps a team is dependent on one critical pass to enter their offense. 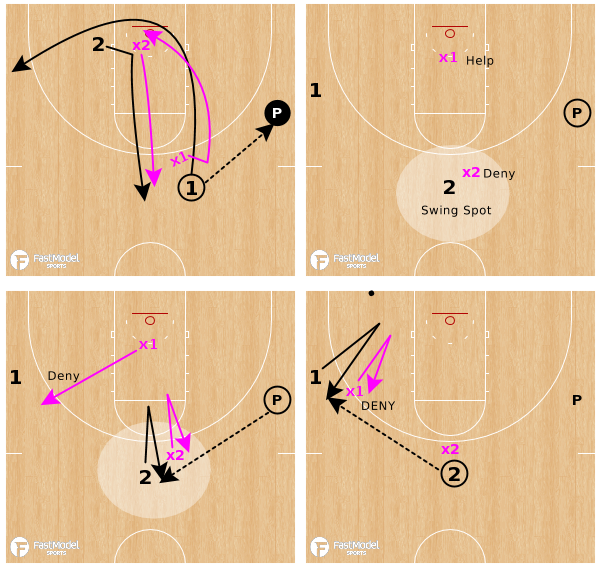 In the Three-Second Deny Drill we are learning to take away the “triggering pass” the offense needs to being their attack. The drill begins with two passers up top and an offensive player (1) at the wing. X1 is in a denial stance preventing the top-to-wing pass. Player 1 cuts in and out trying to uncover. X1’s goal is to deny for three seconds without allowing the wing entry. Should the passer complete a pass to Player 1 in under three seconds, play 1v1 on the catch with 0:05 shot clock. If we cannot get the knock-away deflection for a steal, the next best thing is making the offensive player catch going away from the basket with their back to the rim. If x1 successfully denies for three seconds, pass across the top and Player 1 cuts through trying to get open at the opposite wing (Frame 2). X1 defends the back cut and denies out on the other side again with the goal of a “three-second deny.” Should the passer complete a pass to Player 1 in under three seconds, play 1v1 on the catch with 0:05 shot clock. In the clip above, New York Liberty guard Kia Nurse illustrates the game application of the three-second wing deny during her time at UConn. The Florida State offense is waiting for the top-to-wing pass and Nurse takes it away with textbook wing denial. The denial stalls the Seminoles ball and player movement. Maybe more important that wing deny, is “swing” deny. Ball reversals benefit offenses, thus keeping the ball on a side and making reversal difficult is paramount. 2v2 Swing Deny works on keeping the ball off the swing spot. Set up the drill with a passer on the wing, an offensive player in the slot (Player 1 in Frame 1 above) and a player diagonal from them on opposite block (Player 2 above). Player 1 initiates the drill with a pass to the Passer. A key to man-to-man defense is movement on the flight of the pass. As Player 1 passes, X1 jumps to the ball to deny the basket cut. Player 2 cuts to fill the swing spot. X2 must deny the pass from wing back to point (Frame 2). Do not concede the catch! Player 1 continues their cut out the weakside. X1 must remain on help and not follow the cut out of the lane. The goal is to keep the offense on one side of the floor. X2 challenges the passing lane forcing Player 2 to work to uncover (Frame 3). Denial is the goal, but if a catch happens we want it caught going away from the basket with the offensive player’s back to the rim. Further, if the ball does make it’s way to the swing spot, the mission is now to disallow it from hitting the second side (Frame 4). X1 moves into position to deny Player 1 on the wing on airtime of the pass from the passer to the swing spot. We want the ball to “stick” up top in hopes of terminating the movement of the offense. Denial can be emphasized using a games-based approach as well. Consider playing a halfcourt game of 3v3 Cutthroat with “Passes+Points” scoring. The offense gets a point for every pass they complete plus the value of the basket they make if they eventually score. For example, set up with Team A versus Team B with Team C waiting to rotate on. If Team A makes six passes then hits a three-pointer they take nine points from that possession and stay on offense as Team B rotates off. Team C will rotate in to defend. Even if Team A missed the shot and Team B rebounds, Team A rotates off with six points. Team B goes to offense, Team C comes on to defend, Team A rotates off six points richer! Play for a predetermined amount of time or points and reward the winning trio. This scoring method incentives the defense to deny passing lanes and isolate the ball. Stop the ball movement and force the offense to dribble to a shot. If they do score they were forced to do it off the dribble with minimal ball movement. Even if your defensive philosophy does not entail all-out denial, it is beneficial to practice denial for certain situations. Disruptive denial can frustrate opponents. Gone are their well-rehearsed patterns and comfortable offenses teams spend hours memorizing. As frustration and pressure mounts turnovers can come the defense’s way. Drilling the denial technique and applying denial in live situations in practice exposes players to the effort they must give and the technique they must acquire to be a disruptive force on the defensive end. For help with practice planning and implementation of a pressure man-to-man defense, join our community of basketball coaches! Check out our online course – Pressure Man-To-Man Seminar – as well! Follow #PressureManTips on Twitter!